Federal Health Minister paid off by Taxation Office for all his work raising money off people with addictions. Winston Longbottom, an unofficial and unauthorised employee of the Australian Taxation Office travelled to the electorate of Hastings in order to meet with Greg Hunt, and pay him off for all the work he’s done to keep taxing people’s addictions since becoming the Federal Health Minister in January 2017. 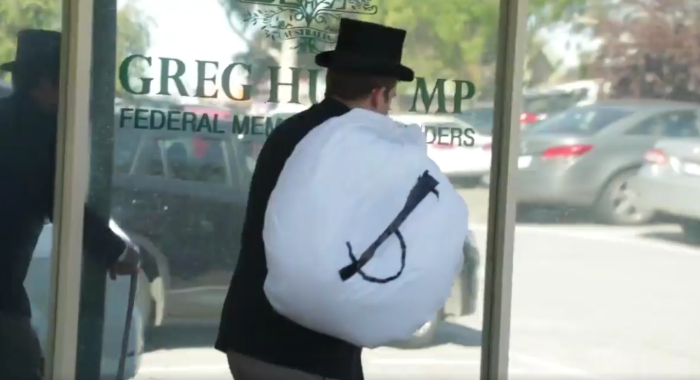 “I’m hoping to meet with Greg Hunt and give him this bag of money as a thank you for everything he’s done to continue raising billions of dollars on the back of people’s addiction to tobacco”, said Winston Longbottom. Winston Longbottom stops by the Federal Health Ministers office in order to pay him off. Whilst the Federal Health Minister was not available on the day to collect his pay off, Winston Longbottom is determined to ensure Greg is supported for all his work preventing smokers from finding a safer, healthier, and cheaper smoking cessation aid. “Vaping may be 95% safer than traditional tobacco products, but we can’t tax it like we can with tobacco. I believe, and clearly Greg Hunt believes, that 52 people dying each day is the price we must pay to ensure the tax dollars roll in!” Said Winston, just before donning his top hat and walking of into the sunset. This was a campaign stunt funded by concerned vapers all across Australia, as part of a Legalise Vaping Australia initiative. It is illegal to even possess nicotine vapes in all states and territories, with penalties of up to $45,000 and 2 years in prison. For more information or to learn more about Legalise Vaping Australia and Vape force one, go to www.legalisevaping.com.au. For media enquiries, contact Brian Marlow (aka Winston Longbottom) on 0439 138 826.